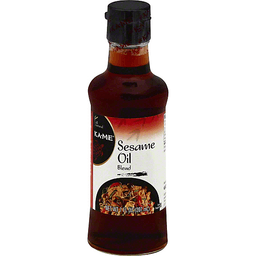 KA-ME® Sesame Oil Blend. Net Wt 7 fl oz (207 ml). KA-ME Sesame Oil is made from expeller pressed, roasted sesame seeds. It is then blended to make it an everyday cooking oil. The Key to Asian Made Easy.™ Ancient culinary traditions thrive today in Asia, where the art of food is a daily celebration. For over 40 years, we've explored the world of Asian cuisine to provide you unique flavors, high quality ingredients with no artificial colors or preservatives, and innovative recipes. With KA-ME, you can prepare simple, convenient and delicious home cooked meals without sacrificing quality, taste, or your limited time. KA-ME: Simple. Delicious. Right for today. Find recipes and learn more about authentic KA-ME Asian foods at: www.kame.com. Visit: www.panosbrands.com. © 2014 Panos Brands.